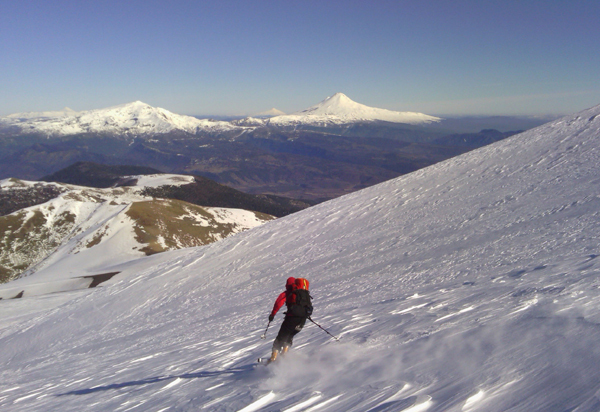 Skiing at Corralco, August 2012. The Andes of Chile have some world class ski resorts. there are no huge Alpine resorts here, but most resorts will provide even the best skiers with a day or two of satisfying downhill skiing on very quiet pistes. High season for Chilean holidays are the last two weeks of July and the week around September 16th-18th (Fiestas Patrias) so avoid these times if you can. There is also the long weekend of the "Assumption of the Virgin" in August, which also can get very busy. An unusual resort. Although in our opinion it is nothing like as good as its reputation, is is still well worth a short visit. The base station is at 2800m, the highest tow takes you to about 3300m. Click here to link through to a Portillo piste plan. These three resorts, known as the Tres Valles, lie about one and a half hours drive from Santiago the capital of Chile. 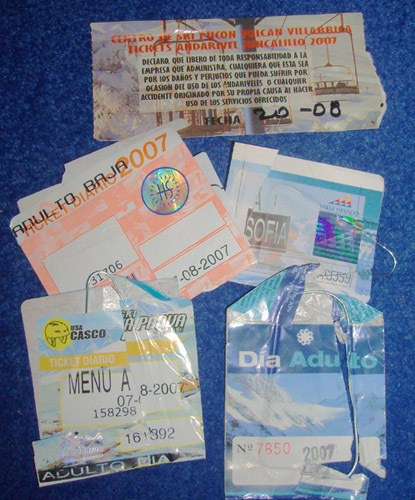 They are now linked by a common lift system and together provide a huge skiable area, althouhg in recent years disputes between the companies have met that common area tickets are not always available. Even a good skier will take a day or more to ski out any one of these resorts. All three together provide a great base for a weeks skiing. They have some excellent long off piste runs and there are several good steep couloirs at the top of La Parva. Click on the following links for piste plans for La Parva, Colorado and Valle Nevado. Chillan is a fairly big resort on the south side of the volcano of the same name. The lift company are a bit unsure at the minute whether they're running a ski area or some sort of a prison camp. They have some pretty tough regulations and can be very inflexible. Make sure you bring regulation ski pants! They seem to be very concerned about illegal access to their snow and if you try to jump over the 2m high perimeter fence you'll probably be shot on sight. That said, if all you want is a quiet days skiing on good pistes then you could do worse. There are enough runs here to keep a good skier happy all day. The resort is a 2 hour drive from the city of Chillan, but there are lots of hotels and cabin accommodations in the area around the resort. The base elevation is about 1600m, top station is at 2600m. We like the long Tres Marias run the best. See here for a Piste plan for Chillan. Antuco is a small resort with just two tows and about 600m of vertical run. It is located about two hours drive inland from the city of Los Angeles. The resort is built on the north side of the volcano Volcan Antuco. Base elevation is about 1400m. The nearest accommodation is a couple of small rustic hotels about half way between the small village of Antuco and the base of the resort. Bring your own skis as renting equipment here may not be possible. A small new resort on the slopes of Volcan Lonquimay, near Malalcahuello. Corralco has only a few lifts but they access a very large skiable area. However the terrain is all pretty similar. Click here for further information and photos. Base elevation is at 1400m, the top station is at 2100m. El Fraile is a small resort with just two tows and about 500m of vertical runs. It is located about an hours drive from the small city of Coyhaique in Chilean Patagonia. The resort is built on the east side of Cerro El Fraile and there are many runs through the trees. Base elevation is about 1000m. The nearest accommodation are the hotels in Coyhaique, although there are a few small ski club huts at the base of the resort. Bring your own skis as renting equipment might not be possible. There is a very small ski field on a hill called Cerro Mirador, just west of the southern city of Punta Arenas. There are about two chairlifts and a few runs down through the trees. The base station is at 300m above se level, the top of the hill about 900m. 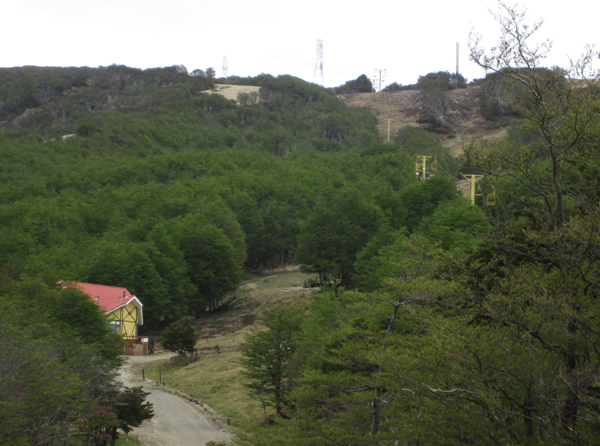 The ski area at Cerro Mirador near Punta Arenas in springtime.